An organization that supports scholarship and social interaction for Korean-American professors selected a Regent University associate professor to be its vice president. Dr. Young Choi of Regent’s College of Arts & Sciences will serve at least one year in the elected role for the Korean-American University Professors Association (KAUPA). He’s been a member of the organization since 2002, and in a leadership capacity as membership director since 2016. 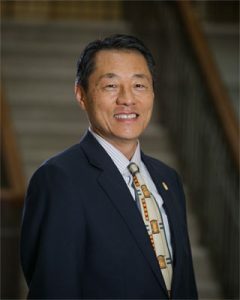 Choi teaches many classes in information systems and cybersecurity and has received numerous awards during his time at Regent for his scholarship and research. He has worked for multiple software companies as an engineer and served in management positions at computer companies in Silicon Valley, California. Choi says he seeks to empower his students to make a difference in a troubled world using their gifts and knowledge in information systems and technology. As a traveler, researcher and editor for academic journals, Choi brings a diverse skill set to his role as vice president of KAUPA. The organization is developing its natural sciences and humanities fields while fostering a creative research environment with the goal of producing future Nobel Prize recipients. KAUPA has 4,000 members in America and Canada. Through KAUPA, they research issues common to Korea and North America, bridge a gap between American and Korean researchers, and sponsor programs for Korean Americans.